First Cleanse is the ONLY cleanse on the market designed specifically for first time cleansers or “sensitive” individuals. 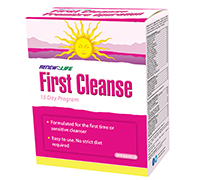 First Cleanse cleanses the entire body with a formula that is gentle, yet strong enough to be effective. It is a 15 day program designed to ease the body into cleansing. 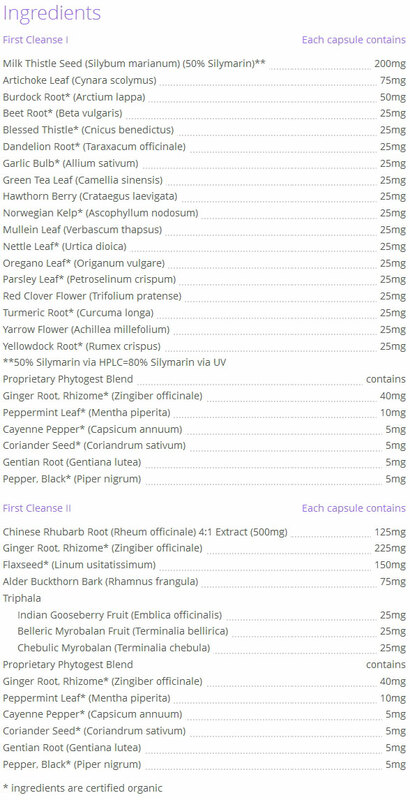 First Cleanse should be taken as follows: 2 capsules of First Cleanse I in the morning with 250ml of water (1 full glass) on an empty stomach, and 2 capsules of First Cleanse II in the evening with 250ml of water (1 full glass) on an empty stomach. Continue this routine daily for 15 days. You can repeat the First Cleanse Kit as required. Warnings: Do not use if you have heart disease, high or low blood pressure, kidney, liver or gallbladder disorder, diabetes or edema or are taking products containing diuretics. Do not use if you have abdominal constrictions of the gastrointestinal tract, potential or existing intestinal blockage, bowel or bile duct obstruction, atonic bowel, appendicitis, inflammatory colon disease, abdominal pain of unknown origin, undiagnosed rectal bleeding, severe dehydration with depleted water or electrolytes. Do not use if you have abdominal pain, nausea, fever or vomiting or if you have a chronic gastrointestinal disorder, inflammation, acute stomach irritation and stomach or duodenal ulcers. Do not use if you are pregnant, breastfeeding. Hypersensitivity has been known to occur, in which case, discontinue use. Do not use if you are allergic to anethole, plants of the Apiaceae/Carrot family, or plants of the Asteraceae/Compositae/Daisy family. Consult a health care practitioner prior to use if you have gallstones, are taking protease inhibitors, have iron deficiency or anaemia, or excess stomach acid. Consult a health care practitioner prior to use if you are taking antiplatelet medication, thiazide diuretics, corticosteroids, licorice root or other medications or health products which may aggravate electrolyte imbalance, or are taking cardiac medications such as cardiac glycosides or antiarrhythmic medications, if you have faecal impaction or if you taking blood thinners. Discontinue use if you experience dizziness, confusion, muscle weakness or pain, abnormal heart beat and/or difficulty breathing. Consult a health care practitioner if symptoms persist or worsen or if constipation persists after one week of use. Reduce dose or discontinue use if you experience abdominal pain, cramps and/or diarrhea. Keep out of reach of children.